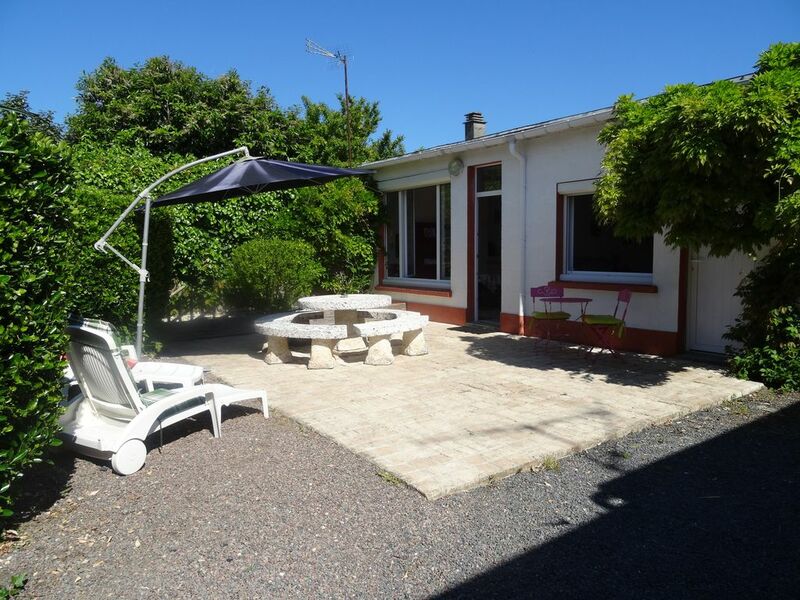 Outbuilding in property, located 500 meters from the sea in the heart of town, the landing beaches and 20 minutes to Caen. Area attractions around: You will love the ports that crisscross our coast including Port en Bessin, Ouistreham, Courseulles and pontoons of Arromanches. You also can stop discover and visit the oyster beds and Asnelles Grandcamp and why not taste the seafood of our land. Finally, the landing beaches, the Bayeux tapestry, the Caen Memorial, casinos, the spa of Luc sea and the beautiful Normandy countryside, including the route of the mills are waiting for you to discover our beautiful Normandy. Sheets, towels and tea towels provided. Sandrine’s sunny welcome matched this sweet, comfortable cottage located just behind her home. The lovely planting, lush vegetable garden, and chicken coop provide a country living feel. The home is decorated with a personal touch. The luxury shower was terrific, the bed comfortable, and the kitchen well equipped and easy to use, including washing machine. The patio area is perfect for relaxing and enjoying the air and a glass of wine or sweet treat after a busy day. A short walk to the boulangerie ensured fresh baked daily bread. And a visit from Goliath, a friendly and gentle dog, was always cheerful. This place is a great location for visiting all the beaches of Normandy and great museums that explain the D-Day invasion. We carry many fond memories of our four day stay! And managing French/English communication was fun! Thank you, Sandrine, for your joyful spirit and welcome! Merci Matthew pour ce commentaire bien étoffé et pour tous ces détails pour mes prochains hôtes. Ca été un réel plaisir de vous recevoir et vous rencontrer vous et votre épouse. A très bientôt de vous revoir si vous repassez par notre belle Normandie. Special Hideaway - You'll Love it! We were so excited when we arrived at this secluded, quiet, sun shiny cottage. Pictures do not convey how wonderful this gem is on the Normandy coast! Everything you would need or want is available - outdoor seating for our evenings was relaxing, bird songs , and fresh flower scents from the Wisteria. Inside multiple areas to relax or plan the next day outing. All you need/want is in the kitchen, and the shower is fabulous! Sandrine was so very kind, sweet, helpful and truly wanted our stay to be the best....she is a delightful lady, also, this place is cheerfully decorated - we didn't want to leave. If it's available when you are looking...better book it! Thanks Sandrine for your smiles and warmth! Que dire après cette belle déclaration et cette mise en avant de mon gîte. Merci, merci, un grand merci. Vous êtes un couple adorable avec qui on a envie d'apprendre, discuter toute une soirée...même si mon anglais laisse à désirer...Merci le dictionnaire. Si vous revenez en France ça sera un immense plaisir de vous revoir et partager des bons moments. Great little getaway in the heart of Normandy! This cottage was the perfect place to stay while spending time in the Normandy region. It was a good size with a fully-equipped kitchen, sitting area, bedroom, and of course a clean bathroom. We even had our own little patio area and often listened the birds in the morning. Did I mention it's only a 5-minute walk to Juno Beach?! Sandrine and Sebastien were great hosts - helping out with things to do in the area (restaurants, etc.) and anything else that might be needed during our stay. We had a fantastic time! Set in restful beach town, the guest house near town center is private but convenient to everything. Larger than expected accommodations. Comfortable bed , living room, and nicely done kitchen. Enjoyed walking through town, on the beach, and discovering restaurants and quiet nooks. Thanks for a great stay! Well appointed for our short Normandy stay, Sandrine and her family were the perfect host`s and nothing was to much trouble, all the beach`s are within easy reach and the Museum in Caen was exceptional, we would not hesitate to return to the cottage again. Les tarifs annoncés sont toutes charges comprises à savoir : - draps, torchons, serviettes de toilette, - le ménage de fin de séjour, - la taxe de séjour, - les charges d'électricité, chauffage, eau. Les locations, uniquement haute saison, débutent le samedi à partir de 16 heures et se terminent le samedi suivant à 10 heures.